After her father's death, Ruth Robb and her family transplant themselves in the summer of 1958 from New York City to Atlanta - the land of debutantes, sweet tea, and the Ku Klux Klan. In her new hometown, Ruth quickly figures out she can be Jewish or she can be popular, but she can't be both. Eager to fit in with the blond girls in the "pastel posse," Ruth decides to hide her religion. Before she knows it, she is falling for the handsome and charming Davis and sipping Cokes with him and his friends at the all-white, all-Christian Club. 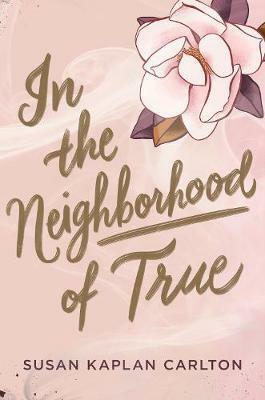 In the Neighbourhood of True tells a story of love, loyalty, and the price of fitting in or speaking out. "Every character is memorable and complex, and the plot quickly becomes engrossing . . . the characters' moral decisions are so complicated and so surprising that many people will be kept spellbound by even the tiniest detail. Riveting." "Carlton does an excellent job of mixing the personal with the historical . . . Ruth crisply relays her conflicted feelings, the tense situations, and characters who are well-shaded and occasionally surprising." "A gorgeous story about a teenage girl finding her voice in the face of hate, heartbreak, and injustice." "Susan Kaplan Carlton's snapshot of 1958 Atlanta is both exquisite and harrowing, and I will hold it in my heart for a long time."